Here is a list of how babies and toddlers play through different ages and stages, and the toys that are a must for your home! 2-4 months: During these months you can hand your baby a small rattle and see her hold it for a small amount of time, observe the object and even mouth it. Small colorful rattles are best for this stage. 3-6 months: Mouthing might be the primary means of exploration for your baby, but around this age your little one will also begin to move, shake, or bang the objects you give her. Colorful and soft toys that make sounds when you move them are recommended. You can also introduce toys with teething sections to soothe your baby’s gums. 5-7 months: During these months, banging toys will start. This stage is all about exploring the effect a toy makes when it hits another. Your little one might bang the toy with her hands or even discover that something occurs when she bangs the toy against another. Noisy objects can be very attractive at this stage. 6-9 months: Your baby’s attention span will begin to increase allowing for longer periods of play with a single toy. However, don’t think she will engage for very long, your baby might only play with a toy for 2-5 minutes. In the other hand, she will explore it in different ways by maybe pushing or turning it. Here you’ll begin to see your baby’s preferences for certain toys when she is playing. At this stage, provide her with different textures to explore. Everyday household objects will be very enticing. Just make sure they are baby-proof before handing them over. 7-9 months: Fine motor skills are beginning to develop so anything that can be torn or crumpled will be fascinating for your baby. Take out some old magazines or roll out the toilet paper and have fun with your daughter while she develops the important milestone of finger dexterity. 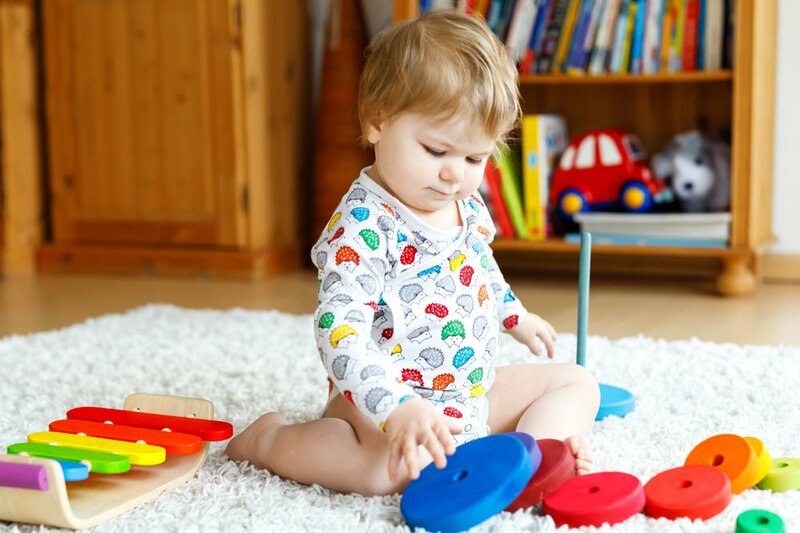 6-11 months: The milestone of rolling or sliding a toy develops during these months. It’s time to fill your home with colorful and soft balls or big toy cars. 9-12 months: Your baby’s growing cognitive development allows her to associate objects that go together such as a spoon and a bowl. Reinforce this cognitive development by playing with objects that go together such as a drum and a stick. As you can see, your baby’s skills develop by playing. It is what children do and the best and most fun way for them to learn. Surround your little one with lots of opportunities to play and explore, and be sure to check out our catalog for lots of ways and ideas to incorporate the suggested toys during play time. And, most of all, don’t forget to have fun!